It’s safe to say that people are pretty obsessed with fidget spinners right now—and we totally get why. They’re colourful, tactile, and just fun to play with. But with so many options out there, choosing one can be a little overwhelming. So, we say why choose? Make your own DIY Fidget Spinner, ball bearing-free! We wanted to share this great DIY tutorial we’ve been finding all over the internet. Created by Red Ted Art, it’s all you need to make your own fidget spinner at home. We’ve tried it here in the office, and trust us, it’s fun. Below is a step-by-step review of how to build that DIY fidget spinner. Feel free to print out the written instructions, they’ll guide you well. Also, there’s a link in Red Ted’s YouTube post for a free printable fidget spinner template that’ll really come in handy! Quick Note: a DIY fidget spinner likely won’t spin as fast or as long. Without a ball bearing, friction will build up much more quickly. It may also fall apart over time, but the beauty of a DIY fidget spinner is you can easily rebuild it—and make it look different every time! Grab a sheet of paper and draw out your DIY fidget spinner shape (we suggest a tri-spinner!). If you want to be really precise, find a template online that you can print out. Quick Tip #1: Don’t throw away your paper cutout until the very end, you’ll want to use it in an upcoming step. Put your scissors to work and cut out your spinner template, then trace it onto a piece of cardboard or a chipboard sheet. Cut out that new shape and say hello to the body of your new fidget spinner. Quick Tip #2: A stiffer or thicker spinner works best. If your cardboard or chipboard isn’t thick enough, cut out two spinners and glue them together! Still got those scissors handy? Great! Cut out two small circles for finger pads so you can hold the fidget spinner in the middle. Quick Tip #3: Trace two of your coins for finger pads! Start with the underside of your spinner first. Play around and decorate it however you like, using different coloured paper, markers, and more. We love patterns or lots of bright colours. Now glue your coins onto the top of the spinner, one on each end. Try and keep them centered, and remember that heavier coins will make for a better spin. We suggest you use a permanent glue, since hot glue doesn’t hold the coins as well. Quick Tip #4: Watch the coins as they dry. If they start to slide around while drying, simply push ‘em back into place. It’s time to grab your needle and make a hole directly in the center of the spinner. It’s important to get the hole as centered as possible or it won’t spin. Widen the hole enough (using the needle, toothpick or the point of your scissors) so that you reduce friction once your spinner’s assembled. Quick Tip #5: Did you hold onto your paper spinner cutout? Great! Fold it in half twice down the middle, and the folds will create a point in the middle of the spinner. Lay the paper cutout overtop your cardboard spinner and push the needle through that point. Bam! Centered! Now use your needle and make holes in the centers of both finger pads—but don’t widen them like you did for the spinner. Quick Tip #6: Make sure you flatten any part of the spinner sticking up (such as the edges of the cardboard), otherwise it’ll create friction and slow your spinner down. Step Five: Fidget Spinners, Assemble! Snip off the end of the toothpick so it’s flat and not pointed. Push the first finger pad all the way to the flat end, then slide the spinner down to meet it. Push the second finger pad down to the spinner, making sure everything is close (but not too close!) to each other. Things are coming along nicely! Grab your glue, and seal up the toothpick sticking out from the first finger grip. This’ll keep both the cardboard and toothpick together, and protect your thumb/finger from rubbing against the toothpick. Then, flip the fidget spinner over and put more glue around the toothpick sticking out of the second finger grip. 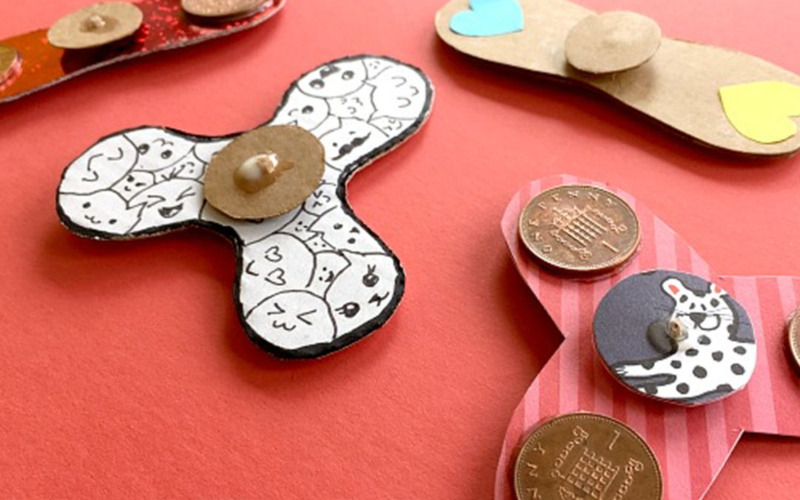 Find a place to set or hang your DIY fidget spinner until it dries completely (we find an hour is more than enough time!). Made sure your DIY fidget spinner is totally dry? Awesome! Now all you have to do is grab your scissors and cut off the rest of the toothpick. If you’d like, seal up the toothpick end with more glue to protect your thumb/finger—just remember you’ll need to give it more time to dry. Step Eight? Spin, Spin, Spin! Man, what a good-looking DIY fidget spinner you’ve made! Show off your new creation by tagging The Packaging Company on Facebook. We can’t wait to see it!